Transyl is a product that has many jobs and it does them all very well. Its versatility makes it a go-to product for many people, as it can assist in many different ways. What exactly is Transyl Oil? Transyl Oil is a lubricating, deep penetrating, self-spreading liquid with exceptional ‘wetting’, spreading and climbing properties. It is able to reach the most inaccessible areas and is perfect for the dismantling and maintenance of metal assemblies and for lubricating hard to reach metal parts. It is a multi purpose problem solver that has been developed for over 75 years and is widely used in the Automotive, Aviation, Rail and Maritime industries as well as the industrial and domestic markets. Transyl oil can be used to lubricate allowing for easy movement of parts, free and release metal works due to rust, remove unsightly sticker residue, clean metal surfaces keeping them looking like new and it can even be used to remove chewing gum from your carpets – that’s right! 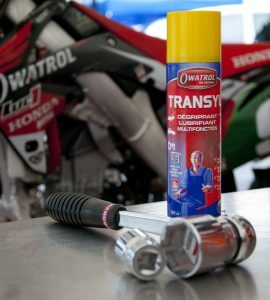 Transyl oil is available in a 200 ml spray can, which comes complete with an extension nozzle – giving you complete control when you need to apply the oil in tight spaces. You can find out more information about Transyl by clicking here. We know we are bias but we simply love Transyl oil and think it should be a staple product in every household! Take a look at our demonstration videos below and see how Transyl oil tackles all kinds of projects with ease. Why not take a look at one of our previous blog posts in regards to maintaining your boat with Transyl and see how it could help you in your next project? Maintaing our boat using Transyl Oil – A handy how to guide on how best to maintain your boat by using Transyl oil. If you have any questions regarding the use of any Owatrol product, please feel free to contact us today.